Day four. On to beef. We like beef here in the Mulkey house. I know you're not supposed to eat much beef anymore. But once in a while is ok. Right? (You can also make this recipe with chicken.) The thing that I like most about all of the recipes in the "Everyday Food. Great Food Fast " cookbook is that the prep is easy and the cooking time is short. Oh, and the food is delish!!!! 1. Into a small bowl, finely grate zest and squeeze juice from 1 orange. Add garlic and soy sauce. 2. With a sharp paring knife, peel remaining 2 oranges. Slice oranges crosswise 1/2 inch thick, then halve slices; push out, and discard any seeds. Set aside. 3. In a medium bowl, toss meat with cornstarch until coated. Heat 1 tablespoon oil in a large nonstick skillet over high heat. Working in batches (adding more oil if needed), brown beef on all sides, 3 to 5 minutes; transfer to a plate. 4. Pour juice mixture into skillet, and boil until syrupy, about 1 minute. 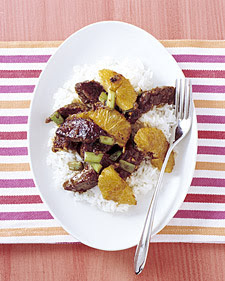 Return beef to skillet; add orange slices and scallions. Toss until coated and heated through. Serve hot. Use chicken breasts and/or shrimp instead of steak and it's great. I've made this with orange juice - and not fresh oranges at all. Still tasted great! I've added broccoli near the end to have a vegetable included. Click here to order the cookbook: Everyday Food. Great Food Fast.